If you’re craving a delicious smoothie that’s also power-packed with nutrients and protein, look no further. 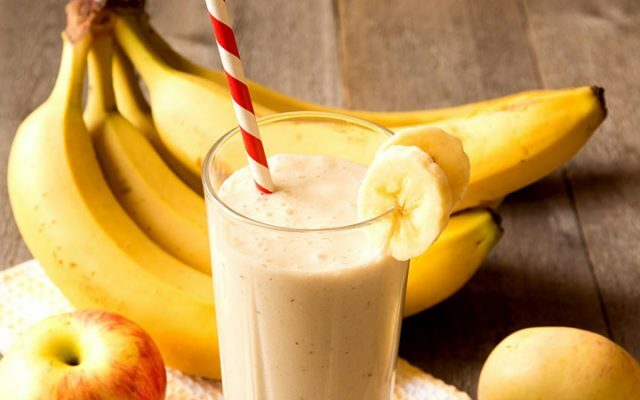 This tasty banana apple smoothie is all that and more. I actually developed this smoothie as a “meal on the go” kind of thing, so it inevitably found its way into our Detox program as a meal substitute, because it had everything we were looking for. Place all of the ingredients into your blender / emulsifier of choice ( our longrunning go-to is this Ninja), and blend for about a minute or until creamy. Feel free to add more chia seeds for a bigger protein punch. If you’ve never had chia seeds before and are curious about them, make no mistake, they are a powerful food for longterm health. Not only does every ounce contain around 4 grams of very digestible protein, but the seeds are loaded with fiber and antioxidants. For smoothies such as this one, they provide a great balance in terms of carbohydrates and protein, and also aid in the digestion process. If you don’t know where to get them, no worries on that. You can buy huge bags of them on the cheap right here. These amazing little seeds also contain a ton of calcium, manganese, magnesium, and phosphorous, all crucial mineral nutrients that many people have problems getting enough of in a typical Western diet. They are also in the proper proportionate amounts and tied with their plant-based phytonutrients, making them far more desirable than getting the same nutrients from a typical multivitamin. It’s so important to find plant-based sources of vitamins and minerals, and not relying on artificial sources. That’s what makes smoothies so powerful. It has been found that most multivitamins are not that effective, because our bodies cannot make use of the vitamins and minerals when they are not attached to plant-based fibers and phytonutrients. Chia seeds are one of nature’s little vitamins: easily digestible, perfect in smoothies, and exactly what our cells are looking for! This vegetable, which is actually a kind of root, is one of those foods that we all know is healthy. We’ve been taught from an early age that they are good for our eyes, for example, since they are packed with beta carotene. However, there’s a lot more going on in there than just a remedy to avoid seeing the eye doctor! Carrots are loaded with healthy fiber, biotin, even Vitamin K, which is a vitamin essential for bone and blood health. In fact, Vitamin K deficiency is rampant in the West and is one of the reasons why vitamin supplements become popular with heart disease patients to begin with. Vitamin K is one of the integral nutrients in keeping our bloodstreams and related systems healthy. Carrots are just one of those foods that can help all of us do just that. There are also a litany of other important phytonutrients found in carrots, such as lutein (helps with eye health) and polyacetylenes (which help cells from becoming cancerous). There is direct evidence that carrots help lower the risk of cancer, so adding them to any smoothie is a good idea. If you enjoyed the smoothie, let us know! We’re always trying to up our smoothie game, so any way we can improve a recipe, we won’t hesitate to try ideas and adapt. We’re looking for healthy, holistic solutions that work!